If you feel the desire to travel, downsize, or seek a thrill, investing in an RV might be the best option for you. There are many different types of people who take on this task. Marc and Julie Bennett, authors of LIVING THE RV LIFE, share their insight on people who discover the RV life. It can be easy to make assumptions about the kinds of people who would choose to live in an RV, whether it’s a motorhome or truck and trailer—but these stereotypes are largely inaccurate. Sure, some RVers are retired—but some work remotely, while others are creating new businesses from the road. Some do “work camping” or have young families. RVers come from all financial backgrounds—some stay in upscale RV parks, others camp in more modest campgrounds, and some spend their time “boondocking”—also known as dry camping—off the grid without being connected to utilities. Some may park their RV in one place to use as a permanent residence, while others use it to travel and explore the country or even the world. They may be of different ages and life stages, come from different walks of life, have differing financial means, and have different reasons for doing it, but they can be found living all around North America—and the world. Millennials looking for ways to travel and explore various career options on their quest for more meaning and adventure (while staying digitally connected). Baby boomers seeking an affordable, exciting way to enjoy their retirement, take their pets along, be of service by volunteering, and visit family while seeing the country. Pre-retirees looking for ways to start easing into retirement by transitioning their careers to working remotely, perhaps with part-time hours or by consulting for their employers. Gen Xers wanting to take their jobs on the road to work remotely or start a business that supports their desire for more balance, freedom, and travel, while saving for retirement (that’s us!). Burned-out career professionals trying to reduce their stress and reclaim their health and life by taking an extended road trip to hit the reset button. Families aiming to reconnect and spend more time together, share adventures, and create memories, often while homeschooling their kids so they can learn via real-world, hands-on experiences. People considering relocation and wanting to travel around the country while they explore and research new places to set down roots. Those wanting to simplify their life, reduce debt, and save for their financial future and goals. Those wanting to embrace minimalism, live frugally, and increase their independence and self-sufficiency while living off the grid. They all have a desire to unplug from society’s “normal” way of life and take more control over their lives, creating their own definition of happiness and success. They all want to experience more travel and freedom. They are open to achieving these goals through an RV lifestyle. 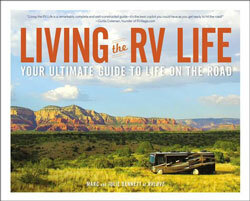 Discover more about the RV lifestyle in LIVING THE RV LIFE by Marc and Julie Bennett! Excerpted from Living the RV Life by Marc and Julie Bennett. Copyright © 2018 by author. Used by permission of the publisher. All rights reserved. Photo by Stijn te Strake on Unsplash. The RV lifestyle could be the answer. 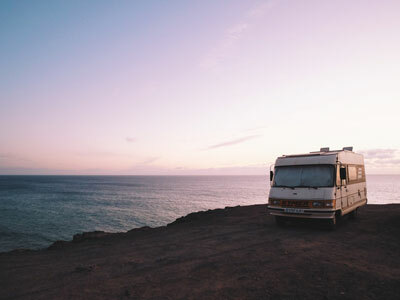 Both aspirational and practical, Living the RV Life is your ultimate guide to living life on the road—for people of all ages looking to downsize, travel, or work on the go. Learn if life in a motor home is right for you, with insightful details on the experiences of full-time RV-ers, tips for how to choose an RV (how big? new or used? ), whether to sell your home (and if not, what to do with it), model costs, sample routes and destinations, basic vehicle maintenance, legal and government considerations—and much more! Written in a light and an easy-to-understand style, Living the RV Life is your bible to living a mobile life.